As Peter Bignell tootles around in the tractor on his historic sheep, beef and strawberry farm, you'd swear you could smell hot chips or dim sims. You wouldn't be far wrong. 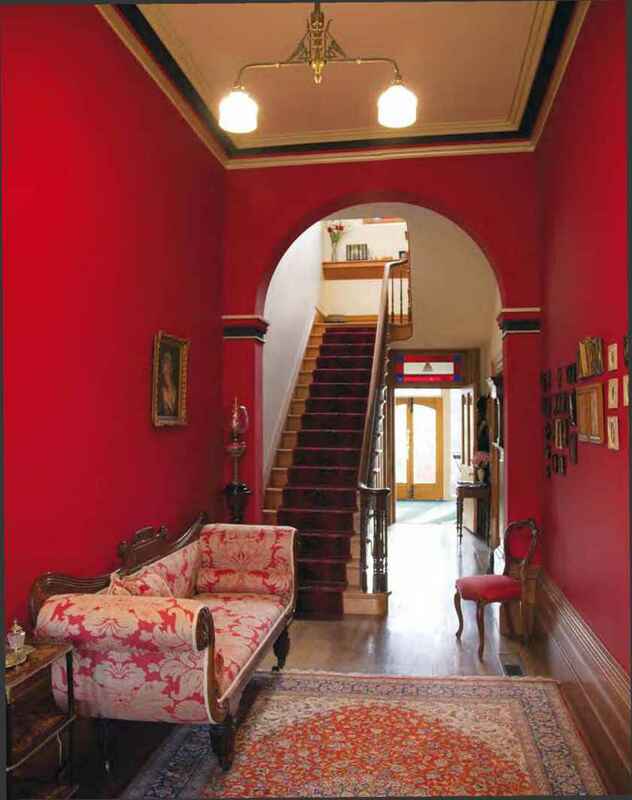 Belgrove was built circa 1888 for Arthur Newell Corney and his family, who came to this property from Lake House at Cressy, near Launceston in the Northern Midlands, which was constructed for Robert Corney. It was the third house at Belgrove, the first being a very early cottage of which only sandstone foundations remain, and the second dating back to the 1840s, parts of which (such as the meat-house, bake oven and dairy) stand in what is now the back garden. 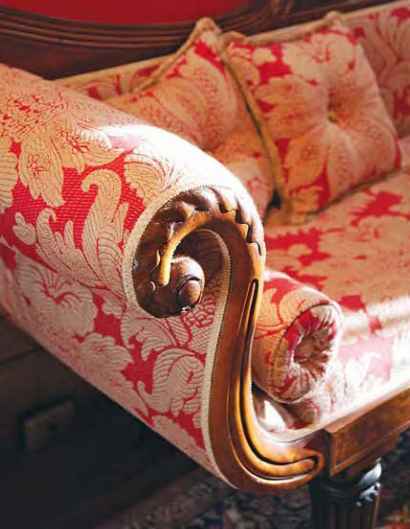 In about 1903, the Corneys sold Belgrove to Arthur Drysdale, known as 'the man with the Midas touch', who at times also owned several other pastoral properties, including neighbouring Mt Vernon and Kelvin Grove. In 1938, Drysdale sold Belgrove for 22,000 pounds to concentrate on building his lavishly appointed Wrest Point Hotel in Hobart. He later owned Hobart's historic Hadleys Hotel and became the sole licensee and proprietor of Tasmanian Lotteries after George Adams' Tattersall's empire transferred from Tasmania to Victoria in the 1950s. The farm passed into the ownership of the Headlam and then the Hawker families before it was put on the market again in 1999.
though she'd passed it countless times before. She went to the open house and instantly fell in love. 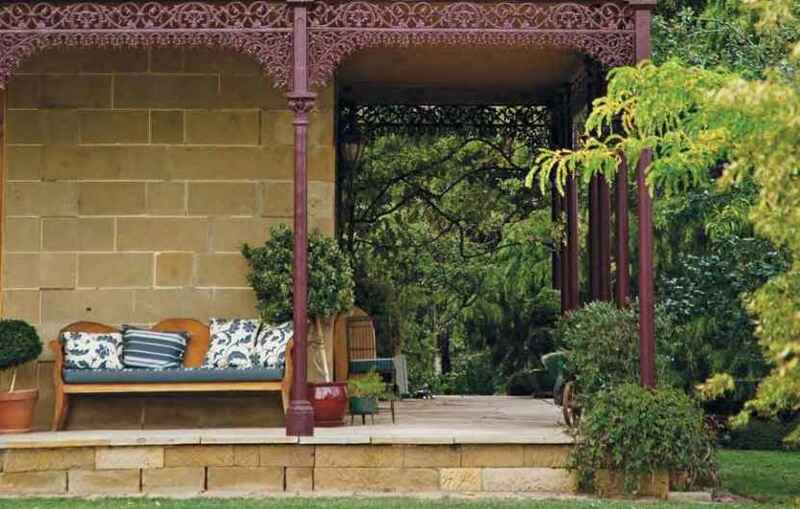 Coming from a sprawling old cottage in the nearby Central Highlands town of Bothwell, it was the perfect upgrade: sandstone, stately, open and light. 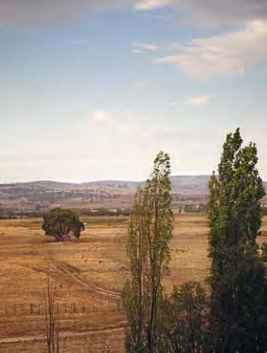 But there were concerns about capitalising so much on a house, and when Belgrove and its 130 hectares were sold to the owners of a shorthorn cattle stud, Sally resigned herself to the fact that it just wasn't meant to be. Eighteen months of drought followed and, on another trip down the highway, Sally once again saw a 'for sale' sign on the white picket Belgrove fence. She wasn't going to let it slip through her hands twice and the transaction was completed in 2001. Having been well looked after throughout the years, there were no structural problems with Belgrove, but it was dated. The bathroom was turquoise, the carpet brown shagpile, there were multiple layers of wallpaper on some walls, a washing machine was in the kitchen because a laundry didn't exist, and the only downstairs toilet was outside. Sally engaged Hobart designer Mirella Bywaters to assist with a full makeover of the interior of Belgrove, with instructions that it combine the old with the new and, most importantly, be practical and liveable. 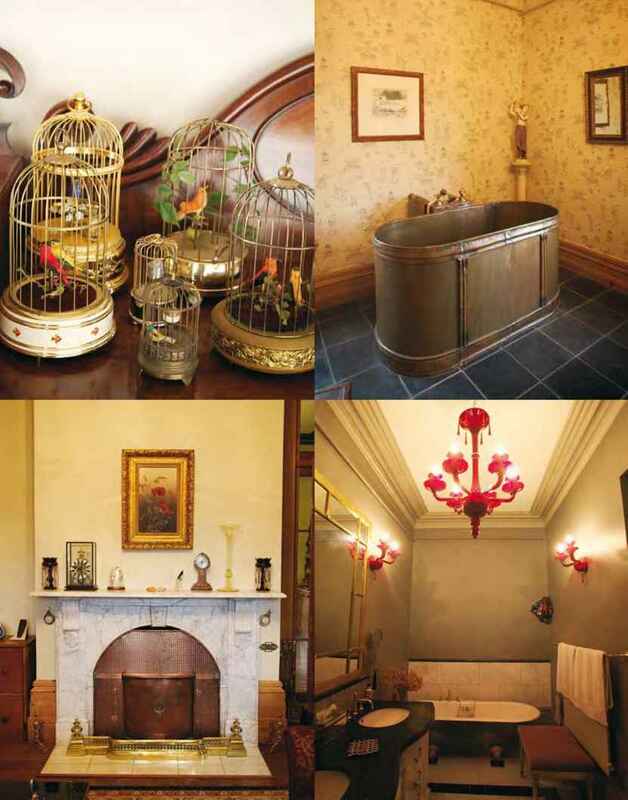 And how much fun both Mirella and Sally must have had scouring Tasmania, the mainland and overseas for the perfect furnishings to set off each room, such as the copper bath in 'his' section of the bathroom, the Italian ceramic toilet and red chandeliers in 'her' part, fittings to match the gleaming green Aga stove in the kitchen, and stunning antiques, ornaments and artwork for every corner. Where appropriate, new built-ins were added, such as the jarrah bookcase in Peter's hunting-themed office, which is adorned with a zebra skin and dark, masculine furniture. The office also has a secret lift-up door in the floorboards, under which Peter has installed a row of containers holding beer and wine supplies which run on mini train tracks for easiest possible extraction. 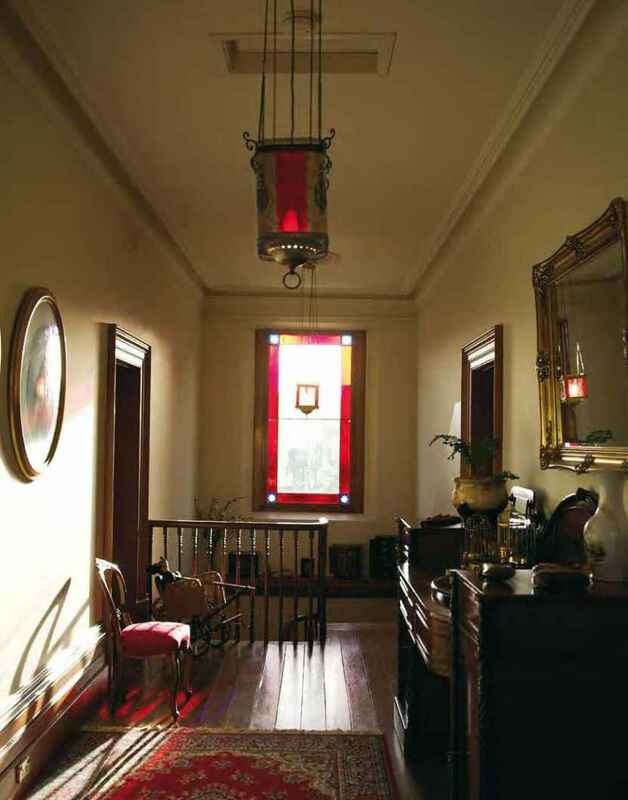 Arthur Drysdale added the sunroom at the back of the home, where nine servant bells line the wall. 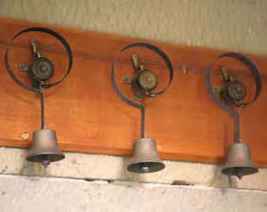 In their first week of living at Belgrove, Sally tried the bell for the master bedroom in the middle of the night. Her husband woke with such a jolt that he went downstairs and opened the front door. But, Sally laments, that's as much of a response as the ringing of servants' bells generates at Belgrove these days. Unlike many Georgian sandstone mansions, Belgrove is light and airy, both in its outlook and its Baltic pine joinery and kauri pine floorboards. 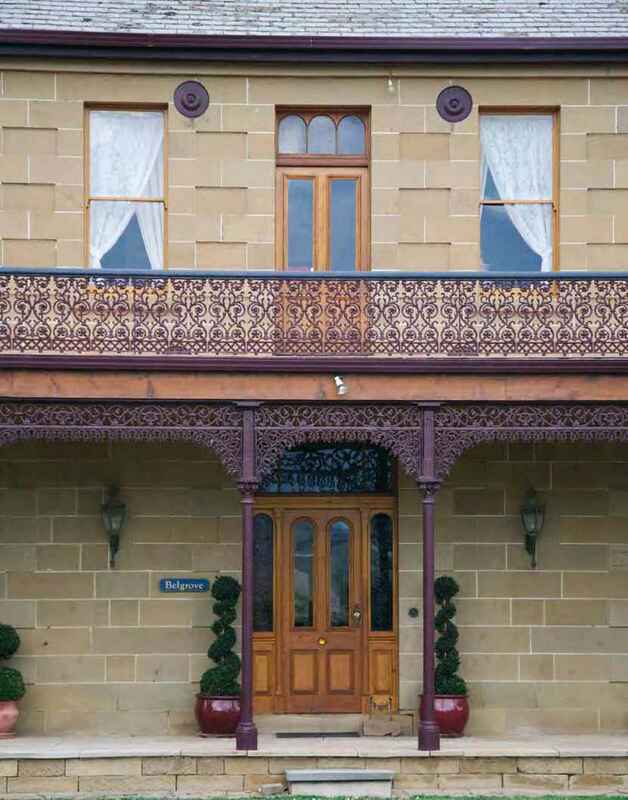 The home is surrounded on two sides by a wide, two-storey sandstone verandah featuring intricate iron lace work. On the second storey, French doors open onto a hall-sized balcony area, providing expansive views across the entire Southern Midlands farming district and up to the Central Highlands lakes district. 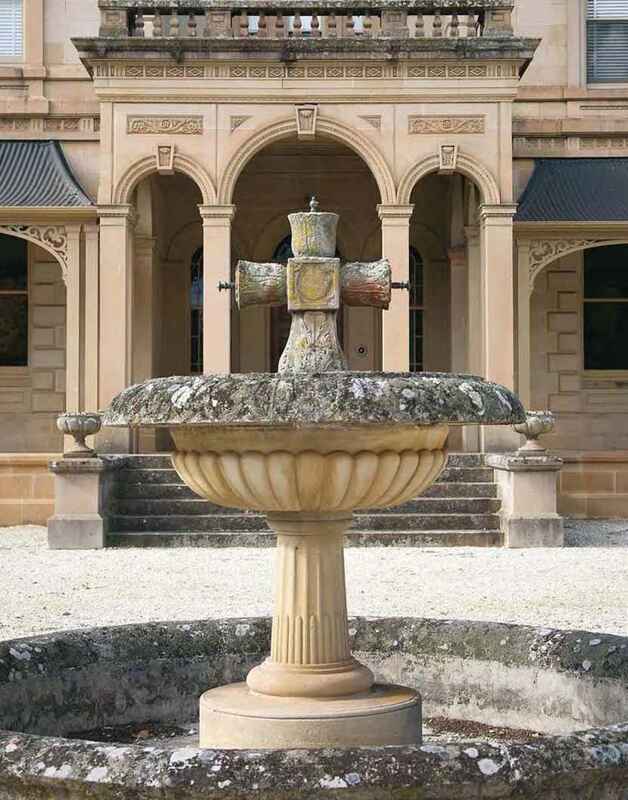 Positioned on the verandah below are a number of sandstone urn flowerpots carved by Peter Bignell's own hand, a skill he discovered when they were still living at Bothwell. Sally had mentioned to her husband one day how much she'd like a sandstone birdbath for the garden. Having never seen one in a shop before, Peter decided to try making one with sandstone from the quarry on the family farm. Using his car's front axle like a pottery wheel, Peter kicked the sandstone block around with his foot while wielding an angle grinder. 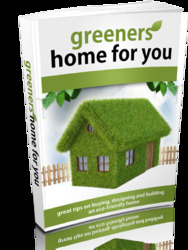 Friends who saw Peter's first effort started placing orders. Then more orders began arriving from Sydney, and not just for birdbaths: sandstone Pooh Bears, big and small, were a favourite for Peter (some he would swap for paintings in the local art gallery). Decorative sandstone balls were also in hot demand—the biggest weighed two tonnes and had to be lifted with a front-end loader onto a truck-axle lathe for carving. Before long, Peter's acclaim grew and he was asked to restore the sandstone sundial in the Sydney Botanic Gardens and undertake sandstone restoration work on several public buildings in Hobart. His biggest job involved carving the three-tiered fountain that is a centrepiece of the conservatory at the Royal Tasmanian Botanical Gardens. When a commercial radio station ran an ad about a sand-sculpting competition on Hobart's Kingston Beach, Peter's interest was piqued. From there began a long reign as the Tasmanian king of sandcastles. The Bignell family would head to the beach for the annual competition, and they regularly left with first prize for sculptures that included a two-metre high church and a similarly sized lighthouse. The principle behind sand sculpting and sandstone sculpting is the same, Peter confides: start with a big block, and then carve the shape out. It was only a matter of time before he set his sights on a new challenge, winning a snow-sculpting competition at Hobart's Antarctic Midwinter Festival with a sculpture of a seal. From there followed an invitation to compete in the Russian Cup in November 2007, a prestigious international ice-sculpting competition held in the depths of Siberia. Peter had never carved ice before but modified some old shearing combs into chisels and practised at Belgrove for months, carving the ABC logo out of bricks of ice he'd made in the deep freezer. In Siberia, his team of two turned four tonnes of ice into a whale-shaped helicopter during five and a half days of work in minus-twenty-five-degree-Celsius temperatures and sixty-kilometre-per-hour winds. It was Peter's carved ice gearbox cogs that actually turned which won over the judges and secured the mayor's sculpture prize and an ugly, but unique, trophy. These days, Peter is working on a new invention for permanently fixing cracks in walls. He's been experimenting on Belgrove; it works, and he hopes to patent Wisecrack soon.